Blizzard introduces the first purchasable minipet that can be traded in game - opening the door to all kinds of transactions. For years, stalwarts at Blizzard damned the illegal gold market in its flagship MMO and claimed that the company would never allow a player to simply buy his or her success in World of Warcraft. The cracks in the wall began to show when Blizzard offered cosmetic minipets for sale in late 2009 but we gave them a pass because, hey, it was for the kids. When the Pet Store opened and we saw sparkly fairy mounts for sale at $25 a pop, we shrugged and thought that Blizzard was just being smart by adopting an aggressive way to sustain revenue when population began to dwindle. Now though, with the introduction of the Guardian Cub, Blizzard seems to have sneakily allowed a way for customers to purchase in game items for real money which they then can trade for gold in WoW. In effect, the Guardian Cub will legitimize gold-farming when it is released in the Pet Store in the next few weeks. "We're ok with it if some players choose to use the Guardian Cub as a safe and secure way to try to acquire a little extra in-game gold without turning to third-party gold-selling services," read the announcement on Blizzard's website. There are limitations to the pet being a long-term way to launder money. 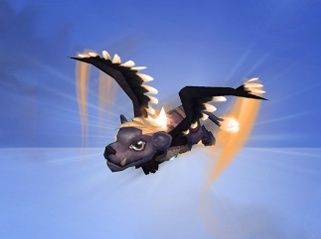 Blizzard will sell the Guardian Cub for only $10, and the little bugger can only be traded once. You can carry as many Guardian Cubs as can fit in your bags (they do not stack and take up one slot each) but players can only add it to their companion list once before the item is soulbound. Blizzard expects the Cub to be used as way to reward guildmates or send a in-game gift to a friend. "In addition to trading the pet, players can give the Guardian Cub as a gift to another character for a special occasion; guild leaders can use them to reward members for a job well done; and so on," read the announcement from Blizzard. Even though that sounds swell, the tone of the announcement seems to prove that the Guardian Cub's true purpose is to provide a legitimate means to do what people are doing illegally. "We take a firm stance against buying gold from outside sources because in most cases, the gold these companies offer has been stolen from compromised accounts. While some players might be able to acquire some extra gold by putting the Guardian Cub in the auction house, that's preferable to players contributing to the gold-selling 'black market' and account theft," Blizzard said. "We also hope this change will help reduce the number of incidents of scamming via trading for invalid pet codes." I get it. From Blizzard's perspective they have seen these activities continue despite their endless attempts to police their own servers. Like the war on drugs, the powers that be at Blizzard have realized that the need exists for customers to exchange real money for gold in World of Warcraft. Rather than arrest the pushers and dealers, Blizzard is now attempt to sell its opiate directly to the masses. On that level, the introduction of the Guardian Cub makes sense but it is still unsettling. I can imagine a future where Cubs are used as a secondary currency like the Stone of Jordan was for a while in Diablo 2. And that freaks me the hell out.